What are your numbers? Credit score of home owners versus time (2001-2016). After the 2008 housing crisis, access to credit has tightened dramatically. Before recession, at the peak of housing boom almost 60% of mortgages were below a score of 740 (considered good). But in 2016, the number is only about 30%. 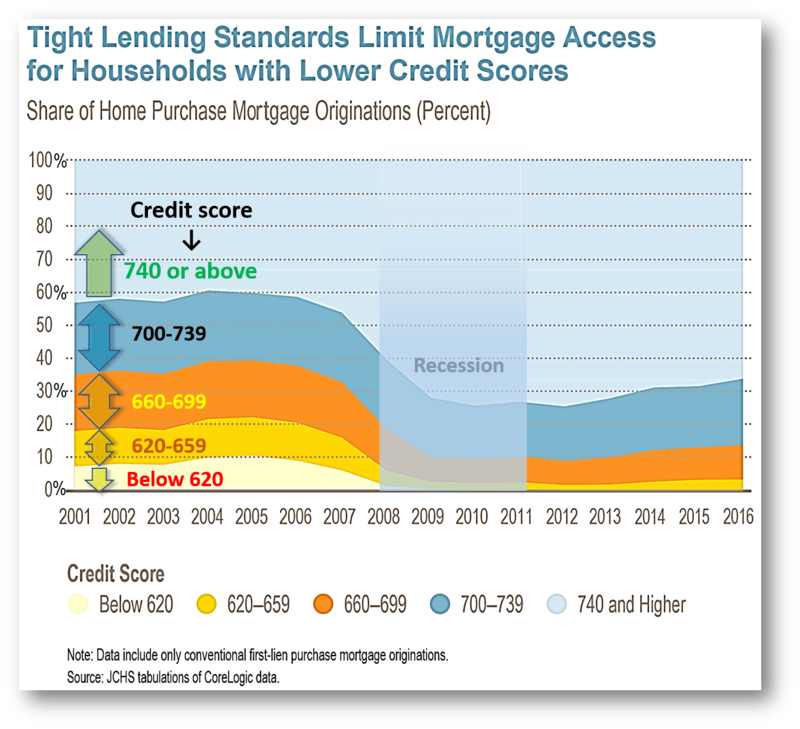 More specifically, the median credit score of a home mortgage owner in 2016 was 732, much higher than the 2005 score of 700. In fact in 2016, only 0.1% borrowers were below 620 & 3.3% were between 620 & 659. The comparable shares in 2001 were 7.3% and 10.6%. This is good news for those worried about another housing crisis, but it reduces lending to households with lower scores, especially young, first time home buyers. Click to enlarge. Source: Chap 4: Joint Center for Housing Studies at Harvard University, released June 16, 2017.